For India, win came too late to be of any significant as they beat Asian champions Korea 5-2 to take the seventh spot in the Olympic Games here this morning. 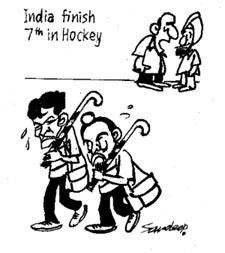 India had finished seventh in the last edition of the games at Sydney. Jamie Dwyer scored a golden goal in extra time as Australia won their first Olympic hockey gold at the 28th Olympics here tonight, beating Holland 2-1. Anju Bobby George failed to give India their second medal at the 28th Olympic Games, finishing sixth with an effort of 6.83m in the women’s long jump event, but still managed to create a new national record here tonight. Ramesh Kumar was the only saving grace as Indian wrestlers made a disastrous start in the Olympics here today. While medal prospect Palwinder Cheema (120kg) lost both his preliminary bouts, the performance of Anuj Kumar (84kg) and Yogeshwar Dutt (55kg) was no better. A last-gasp goal from Melania Grego in extra time gave Italy the women’s Olympic water polo title with a 10-9 win over hosts Greece today. It was Grego’s third goal of the evening that clinched world number two Italy’s only title missing from their collection. Greco-Roman wrestler Karam Ibrahim won Egypt’s first Olympic gold medal in 56 years yesterday, crushing Ramaz Nozadze of Georgia in just over three minutes to lift the 96kg title in Athens. Olympic chiefs ordered Hungarian hammer throw gold medallist Adrian Annus on Friday to submit another doping sample or risk losing his medal, while another of his compatriots was stripped of a medal for failing a test. Annus gave a negative test after winning the hammer throw competition on Sunday. Bublee is a Greek girl. Though she does not even know alphabet of Hindi or Punjabi, she can sing any Indian song. She remembers each and every song of both Lata Mangeshkar and Asha Bhonsle. The International Olympic Committee rejected South Korean requests for the awarding of duplicate gold medals due to a judging mistake in the men’s all-around gymnastics event won by American Paul Hamm, IOC President Jacques Rogge said today. Pakistan would go all out to prove that they have indeed made rapid strides towards regaining top form when they take on world champions Australia in the final of the cricket tri-series here tomorrow, weather permitting. The Haryana State Yoga Association is organising 20th Haryana State Yoga Championship from September 10 to 12 at Gurgaon. The competitions will be held in the age groups of 8-11, 11-14, 14-17, 17-21, 21-25, 25-35, 35-40 and above 45 years both for males and females separately. The competitors’ age will be checked as stand on 1.4.2004. Earlier, a hat-trick by Sohail Abbas gave Pakistan a deserving 4-2 win over New Zealand in the match for fifth and sixth positions. Kiwis led 2-1 at the breather. The Koreans, in contrast, dropped dramatically from their silver medal performance in Sydney. At one stage they were in running for a semifinal berth but their 2-2 draw against Germany in their last pool encounter pushed them to classification cluster where they lost both their matches to end eighth. Koreams, however, could draw some consolation for producing the top scorer of this tournament in Lee Jung Seon who scored 10 goals. Though he had been a consistent scorer with his penalty flicks, but today he failed to score even once. The day definitely belonged to young Gagan Ajit Singh, who scored the first two goals in the fourth and 11th minutes. On his first strike, he single-handedly took the ball into the striking circle, withdrew Korean goalkeeper Kim Jong Min from his position and had an open goal before him. He followed it up with yet another smart move, scoring from a rebound to the great delight of a small but knowledgeable crowd. Two more goals followed. The first and third for India came from Vikram Pillay, and the fourth from Prabhjot Singh. The score at the breather looked one-sided, with India leading 4-0. Korea, who had failed to convert any of the seven penalty cornersthey received, finally got their game together in the 57th minute when Ji Seon Hwan intercepted a free hit to beat Adrian in the Indian goal. A few minutes later, Kang Seong Jung scored from a penalty corner to put the Koreans back into the match. The Koreans pressure notwithstanding, India consolidated their position with a brilliant goal by Adam Sinclair in the 68th minute. Dhanraj Pillay, probably playing his last Olympic hockey match, finally made an appearance during the fag end of the match. Though he had announced that this was his last Olympics, he would continue to play for the country in international hockey. In another classification match, Britain outstroked South Africa 5-4 in the tie-breaker to take the ninth spot. ATHENS: India’s star striker Dhanraj Pillay is unhappy that he did not figure in the starting list of what was his last game in the Olympics, saying that probably the coach did not think him good enough for the match. The 36-year-old Pillay, who has been at the centre of a controversy for his critical remarks against coach Gerhard Rach, came in towards the fag end in the classification match against South Korea and had another swipe at his German-born coach. The match ended in a 1-1 draw with Ronald Brower (8th minute) scoring for Holland while Travis Brook equalised for Australia in the 37th minute. The score read 1-0 at half time in favour of Holland. Earlier today, world champions Germany clinched the bronze beating Spain 4-3 through Bjoern Michel’s golden goal in an absorbing contest. Spain, who led twice in the match, had to content with the fourth position after Germany played out of their skin to topple their rivals in a fast-paced encounter at the Helliniko Hockey Centre. Some intense hockey marked the first half of the bronze medal match even though both sides found the post once each during the period — with Germany taking the lead in the 21st minute through a Sascha Reinelt strike which was followed by the equaliser from a penalty stroke by Santiago Freixa. Germany, who had finished fifth at the Sydney Games, went into their shell after taking the lead, which prompted Spain to go for the kill. Freixa created a couple of great scoring opportunties but failed to make use of them. The teams came close to take the lead but failed to grab the chances that came their way and went to the half-time at 1-1. Anju set the national record in her very first attempt and had a steady decline in her performance with two foul attempts. Anju jumped 6.75 in the second attempt, 6.68 in the third and 6.61 in the fifth attempt. Though Anju touched the same mark in Eugene Prefontain Classics, USA, in June this year, but the wind aid read +2.6m. Here, Anju’s effort had +1.2m wind aid. Russians made a clean sweep of the medals as Tatyana Lebedeva clinched the gold with an effort of 7.07m in her second attempt, Irina Simagina bagged the silver and Tatyana Kotova managed the bronze. Though both Irina and Lebedeva jumped 7.05m, the former got the silver on the basis of her second best effort of 7.02 compared to the latter’s 6.84m. Lebedeva had also won the bronze medal in the triple jump. Meanwhile, the Indian 4x400m women’s relay team, comprising Rajwinder Kaur, K.Beenamol, Chitra K.Sonam and Manjit Kaur, created a new national record and sailed into the final of the event. The Indian quartret clocked 3:26.89 to eclipse the previous record of 3:27.35 and finish third in the first round in heat two. India finished third behind favourites USA (3:23.79) and hosts Greece (3:26.70) to qualify for the final, which would be held tomorrow. This was only the second time that India made it to the final of the relay after the P.T. Usha-anchored squad achieved the feat in the 1984 Los Angeles Games. India were given a flying start by Rajwinder, who came from behind to hand over the baton to Beenamol in second place. Beenamol managed to maintain the pace and passed the baton to Chitra who ran a poor third leg as India slipped to fifth place going into the last lap. After losing his first bout to Apostolos Taskoudis of Greece, Ramesh Kumar kept his chances alive in the 66 kg category with a narrow 3-1 win over Armenian grappler Zhirayr Hovhabbisyani. In fact, in the first bout also, after conceding a big10-2 lead in the first round, Ramesh fought back in the second to reduce it to 8-10. Artur Taymazov of Ukraine did not allow Palwinder to settle down in the opening bout of the 120kg category. Agile and experienced, Artur had Palwinder on the receiving end in the first round itself. The Ukrainian grappler not only took a comfortable 10-0 lead in a little more than a minute but also got four classification points which were enough for a referee to terminate a bout. In his second bout, Palwinder put up a gallant fight against Marek Garmulewicz of Poland and lost narrowly on points (6-4). With two defeats in two elimination bouts, Palwinder ran out of chance of advancing further in the competition. In the 84kg category, Anuj Kumar ran into a tough opponent in Iran’s Majid Khodaei and lost the first bout on points (5-1) while in the second, it was Japanese Hidekazu Yokoyama who took good measure of him and pinned him down on points (11-5). Yogeshwar Dutt (55kg) lost by a whisker to Chikara Tanabe of Japan 3-4. A little more application of his tactics would have earned him a win but he lacked finish and allowed Japanese to wriggle out of his grip in the first round. Yogeshwar lost his second bout to Namig Abdullayev of Azerbeijan on points (6-2). In Greco-Roman wrestling, India’s lone entrant Mukesh Khatri was also eliminated in the first round. The ghost of disgraced Greek sprinter Kostadinos Kenteris returned to haunt the Olympic Games when a noisy protest from the bulk of the 70,000 spectators delayed the start of the 200 metres final. Greek spectators, furious at the absence of Kenteris who won 200m gold in Sydney four years ago, jeered and whistled as the finalists prepared for the start and shouted ‘Hellas, Hellas’ (‘Greece, Greece’) for several minutes yesterday. When the final got underway, America’s Shawn Crawford clinched gold in 19.79sec making him the eighth fastest performer of all time and sweeping away memories of his failure to even get into the medals in the 100m. The 26-year-old’s feat deprived training partner Justin Gatlin of emulating Carl Lewis in 1984 of completing the sprint double as the 22-year-old took bronze with Bernard Williams splitting them to complete the first USA cleansweep since the 1984 Games. 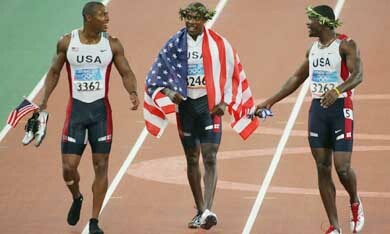 The US celebrated another gold when Dwight Phillips added the Olympic long jump title to his world outdoor crown. America can probably look forward to a further gold in the women’s 4x100m relay as three-time Olympic champion Marion Jones, running the second leg, ran the third fastest time in Olympics history in their opening heat. Meanwhile, American-born Felix Sanchez won the 400 metres hurdles gold representing the Dominican Republic, the birthplace of his parents. The man known as Superman extended his unbeaten streak to 43 races but he looked to be under the cosh from American champion James Carter on the bend. However Carter folded and Sanchez ran away with the title while the American faded to fourth. The booing and the chants of the Greek crowd, and indeed the whole case of Kenteris who withdrew rather than face a full scale inquiry over missing a dope test, received a sympathetic hearing from Crawford. “I think I can understand what they are going through,” said the new 200m champion. Frankie Fredericks, 36, bowed out in style in the 200m final. He didn’t quite make it onto the podium but the four-time Olympic silver medallist still finished a respectable fourth in what was his final race. The Namibian had made his own efforts to calm down the crowd rising from his blocks to plead with them to allow the show to go on. But when it came time to bring the curtain down on his glorious career he tried to talk but only tears came and he retreated to a quiet corner. It was left to Crawford to pay a tribute. World champion Sanchez is certainly the man that everyone involved in the 400m hurdles looks up to and probably will do for a long time to come after adding the Olympic title to his collection. However, even he admitted he was prone to feeling the weight of the occasion. “You’d have thought after 42 races it would get easier,” said the champion. “The confidence was still there, but pressure wise I was very emotional coming into the stadium after all the hours of waiting with the day off. And he was quick to dispel any doubts that he was only running for the Dominican Republic as a flag of convenience. It ended the dream run of outsiders Greece, who had battled from the outset in front of a noisy home crowd at the Olympic Aquatic Centre with Kyriaki Liosi scoring five and Evangelia Moraitidou, three. “Our lack fo experience and the way they were able to turn the game around,” Liosi said of the loss. Martina Miceli opened for Italy with the first of her three goals. Moraitidou got two back in the first period with defender Liosi finding the net with a superb effort from 20 metres. In-form Greek goalkeeper Georgia Ellinaki did well to keep the Italians at bay early but Grego got one past her towards the end of the first period. Liosi and Miceli both scored their second goals in the second period, with Manuela Zanchi grabbing the equaliser for Italy at 4-4, with an unmarked Silvia Bosurgi making a solo break to put Italy 5-4 ahead. Moraitidou put Greece in front again with her third, but Giusy Malato drew Italy level at 6-6 in the third period. Liosi was on the spot to put Greece ahead again in the last period before Micheli levelled, ensuring that the match would be decided in extra time after the scores were tied 7-7 at the end of regulation time. Liosi and Aikaterini Oikonomopoulou scored for Greece in extra time but a goal from Tania di Mario and two from Grego sealed the victory for the Italians, who had beaten the Greeks 7-2 in the preliminaries. Earlier, a hat-trick from centre forward Ellen Estes helped world champions USA win the bronze against Olympic champions Australia. Ibrahim started in typically aggressive fashion, seeking quick points in a bid to assert control of the bout. He surrendered the first point, but then stormed back to clinch the tie 12-1. In Athens, the Egyptian’s opponents stood no chance as the tall, broad-shouldered wrestler used his strength and balance to win his bouts comfortably. Ibrahim blew kisses to the crowd and bowed as they applauded his win achieved in just over half the allotted six-minute period. The bout was concluded before the clock ran out because Ibrahim achieved a winning margin of at least 10 points. Alexandr Dokturishivili of Uzbekistan won the 74kg gold after beating Marko Yli-Hannuksela of Finland 4-1, while Jung Ji-hyun of South Korea beat Cuban Roberto Monzon in a tight contest for the 60kg crown. “When I saw that all my other compatriots were winning medals and that they did not expect one from me, I thought I’d show them,” said the Korean. Russian Varteres Samourgachev earlier took the 74kg bronze medal after scoring an easy 10-0 victory over Reto Bucher of Switzerland. Armen Nazarian of Bulgaria, a gold medallist in the past two Olympics, won the 60kg bronze by overturning a 2-0 deficit against Alexey Shevtsov of Russia for a 4-3 score. Olympic chiefs ordered Hungarian hammer throw gold medallist Adrian Annus on Friday to submit another doping sample or risk losing his medal, while another of his compatriots was stripped of a medal for failing a test. Annus gave a negative test after winning the hammer throw competition on Sunday. He then returned home, in apparent contravention of regulations, and announced his retirement. "Annus will be the subject of out-of-competition testing," said IOC President Jacques Rogge, whose war on drugs cheats has led to a string of athletes being thrown out of the games. An official at Hungary's sports ministry said the IOC demands contravened doping rules. "The information we have now is not in compliance with the regulations," official Gyorgy Bakanek, a doping expert, told Hungarian news agency MTI. Ferenc Gyurkovics became the third Hungarian athlete to run foul of doping laws on Friday, losing his silver medal in the 105kg weightlifting after testing positive. Earlier, Hungarian Robert Fazekas lost his discus throw gold medal for failing to provide a sufficient urine sample and compatriot weightlifter Zoltan Kovacs refused to take a dope test. Doping cases, mostly in the weightlifting and embarrassingly for several of the host nations own athletes, have tarnished the games. In another controversy, US Olympic chiefs accused world gymnastics officials of putting "outrageous and improper pressure" on gold medallist Paul Hamm to give his medal to a South Korean rival. The International Gymnastics Federation (FIG) has said Hamm, placed first in the all-round event due to a judging error, and bronze medallist Yang Tae-young should have been awarded gold — but it has no mechanism to overturn the original decision. The FIG has now gone a step further and written to Hamm suggesting he could return his medal at its request, according to a letter released by the US Olympic committee. As the downtown temperature nudged 38 C, a Norwegian mountain biker's victory stirred longings for a cool fjord breeze. Gunn-Rita Dahle gave her country their first Olympic cycling gold in 32 years, overcoming the heat and mechanical problems to win the women's cross country title. The 31-year-old from Stavanger rode the 31km course along dusty tracks north of Athens in just under two hours. "I fell once and I damaged the gears which slowed me down a bit," Dahle said. "I had to get off the bike and push on some of the steepest parts of the course." 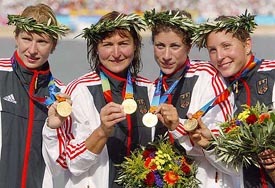 In a cooler race, German canoeist Birgit Fischer won her eighth gold medal at the age of 42 when her K4 crew came from behind to beat world champions Hungary in a thrilling race. Fischer, who will bid for a record-equalling ninth gold in the K2 500m on Saturday, punched her fists in delight and was mobbed by photographers. She is the only woman to have won Olympic medals 24 years apart. Polish walker Robert Korzeniowski (36) made history with his unprecedented third consecutive title in the Olympic 50km walk, although there was barely anyone to watch him enter a near-deserted Olympic stadium. "That's it. That was my last step today as a top-class walker," Korzeniowski said. "It was the title I wanted the most, the one I dreamt about the most. The heroics of Iraq, the brilliance of Argentina and the fierce will of a Paraguay team on a two-fold mission have saved Olympic football from slipping off the radar in Athens. Many games have been played at virtually empty stadiums, despite the feel-good factor generated by Greece's shock Euro 2004 triumph in Portugal. The Greek men's and women's teams lost in the first round, compounding the sense of shame the country felt after two Greek sprinters pulled out after missing dope tests. Only 10,000 people watched the USA give Hall of Famer Mia Hamm the perfect farewell with a 2-1 win over Brazil in the women's final on Thursday. With Greece and co-favourites Portugal failing to advance to the quarterfinals of the men's tournament, the focus switched to Argentina and Iraq. Argentina have not won an Olympic gold medal since the 1952 Helsinki games but the football players are strongly fancied to end that barren run in Athens. The Argentines, who brought a squad largely unchanged from the one which finished runners-up to Brazil in last month's Copa America, face Paraguay in the Olympic final on Saturday. Boca Juniors playmaker Carlos Tevez has been the player of the tournament with seven goals, and Argentina have scored 16 without reply in five matches. Satirical writer P.J. O'Rourke wrote: "Paraguay is nowhere and famous for nothing." But the Paraguay football team have made history for the isolated South American country. 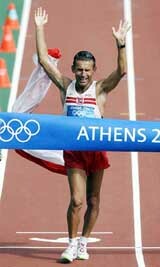 Paraguay, with a population of under six million, had never won an Olympic medal before Athens. Guaranteed silver, Asuncion's city government has lifted the law forcing bars and clubs to close at 2 am for the final. The players, meanwhile, are dedicating their wins to the victims of a supermarket blaze that killed more than 400 people in Asuncion this month. Iraq really captured the imagination of the outside world, even if they too failed to fill the stadiums. Not long ago, the Iraqi players lived in fear of Uday Hussein, the violent son of toppled dictator Saddam, who used to run the national football team with an iron fist. Their run to the semifinals, where they lost 1-3 to Paraguay, was a remarkable achievement for a team forced to train alongside grazing sheep in war-torn Baghdad. Controversy threatened to overshadow events on the pitch, however, after US President George W. Bush referred to Iraq's participation in a campaign ad for his re-election. The broadcast prompted outrage among the Iraqi players, one of whom asked: "How will Bush meet his gold having slaughtered so many men and women?" However, Iraq could still win only the second Olympic medal in their history if they can beat Italy in the third-place match. The retirement of Hamm, widely regarded as the best female player in the world, prevented a lop-sided women's tournament from being a complete washout. Italy extinguished Iraq’s dreams of an Olympic medal in the men’s soccer tournament with a 1-0 win today in their bronze medal match. Italy’s players wore black armbands for the game in Thessaloniki in honour of an Italian journalist who was killed by kidnappers in Iraq. Parma striker Alberto Gilardino headed home a cross from captain Andrea Pirlo after just eight minutes to end Iraqi hopes of a second Olympic medal in the war-torn country’s history. Reporter Enzo Baldoni was seized by Islamic extremists on a road between Baghdad and Najaf. The Italian government said yesterday that his captors had killed him. Bublee is the most sought-after person for any function of the Indian-Greek Association. She not only sings Indian songs but is a versatile dancer. “She is amazing,” says Mr Maghar Gandhi, president of the Indian-Greek Association. Mr Gandhi, who comes from Chandigarh, is perhaps one of the oldest members of Indian community here. He is in to shipping business and has been in Greece for more than three decades now. Family back home is into boat manufacturing and export business. Bublee has an interesting tale to tell. Though her mother did not like her infatuation for Hindi songs, her grandfather, with whom she stayed in the erstwhile Soviet Union for a while, encouraged her to follow the legend Indian singers. “You just give me the first stanza of any song of Lata or Asha, I will sing it for you,” she says as she holds the elite Olympic family gathering from Africa and Asia enthralled with her numbers at a special party organised by the Indian Olympic Association chief, Mr Suresh Kalmadi, last night. Besides Bublee other attractions at the reception held by Mr Kalmadi were world’s top pole vaulter Sergei Bubka of Russia, president of the International Amateur Athletic Federation, and members of the International Olympic Committee from various African and Asian countries. Ministers in the previous NDA Government Mr Digvijay Singh and Mr Shatrugan Sinha were also cynosure of all eyes. Members of the Algerian National Olympic Committee discussed in detail about holding of the next edition of Afro-Asian Games in Algiers in 2007. “We are going ahead with our preparations in right earnest,” remarked one of them holding that India should be the natural choice for staging Olympic Games in 2016 or 2020. The IOC also turned down an official German petition for duplicate gold medals following a judging error in the three-day equestrian competition. Rogge said the IOC will consult with international sports federations to see how judging and scoring can be improved, and that gymnastics has already agreed to revise its rules. Rains have played havoc with all the three league matches of what was billed to be a lead-up tournament to the ICC Champions Trophy, starting in a fortnight’s time in England, and it remains to be seen if the weather Gods relent to allow a full game on the morrow. The weather has been clear for the past 48 hours but the scene can change any minute here. India, the third side, would watch the action from the sidelines, after their opening game defeat to Pakistan and subsequent rain abandoned match against Australia, when the two teams fight for supremacy at the picturesque VRA ground. Selected state team will participate in the 6th North Zone Yoga Championship from September 27-28 at Jammu and the 29th National yoga Champion-ship from November 25 to 28 at Chennai, according to Mr Ashok Kumar Aggarwal, hony secretary-general, Haryana State Yoga Association. Entries will be accepted up to August 30.